We will highlight two more artists this week. 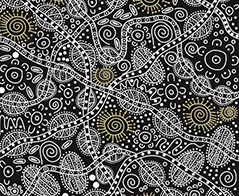 June Smith is a well known artist in Santa Teresa, Alice Springs in Central Australia. Born in 1960 in Alice Springs, she grew up and studied in Alice Springs, as well. She is the first person in Santa Teresa to paint on silk. 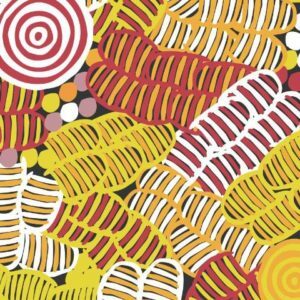 Bush food (referred to as bush tucker in Australia) traditionally refers to any food which is native to Australia and is used as sustenance by the original inhabitants, the Australia Aborigines. For thousands of years, Aboriginal people survived living off the land, eating well when food was plentiful and conserving it in times of drought. 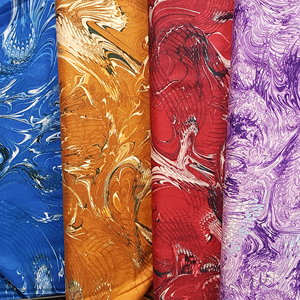 Bush Tucker fabric is available in four colorways. The second artist, Betty Mbitjana, is from Utopia in Central Australia. She is well known in Australia as well as many other countries where her artworks are in high demand. She inherited Bush Melon Dreaming from her mother Minnie Pwerle, now passed on. Ms. Pwerle was one of the great Aboriginal artists. The bush melon is a sweet bush tucker which once grew in abundance in Utopia. As well as providing water, these melons are a good source of some essential vitamins and minerals. Native women would gather the fruit to be eaten at once or to be stored for times when bush tucker was scarce. The Aboriginal iconography in this work refers to awelye (body paint) associated with the women’s ceremony and the bush melon. She depicts the bush melon in vibrant colors with the u-shape lines representing women while the other lines represent body paint markings. The large circles represent a ceremonial site; the small circles the bush melon. The dotted areas represent seed pods from the bush melon. Bush Melon fabric is available in two colorways.